This July marks my third year of blogging from the studio. I used the above image in the first post I made. I suppose it’s appropriate, then, to return to the design now. The little pendant got some use for testing underglazes, but I quickly got brave enough that most of the testing went on to full-bodied models. It did prove really valuable for testing art glazes, though. 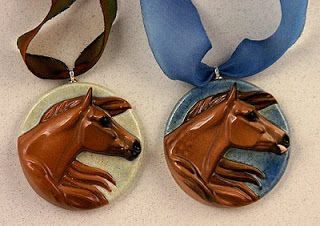 Low-fire art glazes like the ones commonly used for award medallions are designed so that darker pigment pools in the recesses. This is great for textured surfaces, and is one reason why a lot of the backgrounds on my medallions have stamped patterns. The glaze works really well with those kinds of treatments. What many glazes do not do well are larger, smoother surfaces. Some of them puddle oddly on them, while others just do not show enough contrast. Horses, with their big muscle masses, have a lot of flatter surfaces, so glaze that can look great in another application might not always flatter them. So the pendant mold became my favorite way to see how a given glaze formula might work with a horse shape. The ones in the above picture are my glaze chips. They have a bail at the top like a pendant, but in this case that is so I can hang them as a group on a cord on the wall of the studio. The glaze formula is written on the back of the pendant, so I can pull whichever I need and recreate the color. 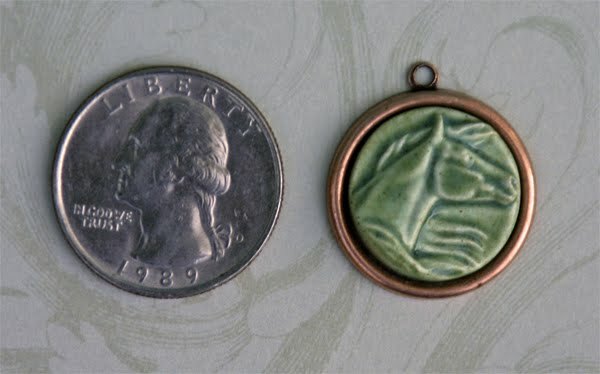 Back when I was shrinking the Celtic Pony medallion, I also shrank the pendant. The pendant was already small – only 1.5″ in diameter – so mostly I was just trying to see how small I could go before the detail was lost. I ended up with an image around 18mm in diameter. At the time I thought the size might work well for a bead, but the design was too thin to run a stringing hole. 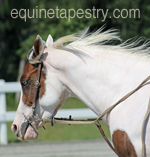 The other option was to punch holes in the sides of the design so that links could be fashioned, but the only open areas (behind the neck, under the chin and below the forelock) would tilt the head at an rather strange angle. That’s when I decided to weld two mini-pendants together back to back. That’s how the bead above is made. The stringing hole runs down the center between the two sides. It worked, but it was far too time-intensive to make, and far too easy to squash the design while trying to manipulate the two sides together. That was the point at which I set the project aside, thinking that it was educational to shrink something so small, but that nothing practical was going to come from it. That was until I ran across some base metal bezel settings. I love the recent jewelry trend for using antique copper and natural brass, so I often check out the new offerings. When I saw the copper bezel setting (second from the right), it struck me that it was probably the same size as my tiny pendant. When I brought it home, I could see that it was just a millimeter off (17mm). I was able to trim the pendant in the greenware stage, but I did wonder if there were other setting sizes available online (17mm seemed like a “off” size to pick). Sure enough, there were a variety of settings with 18mm being more typical. The first and third pendant in the picture are 18mm antique brass and copper respectively. 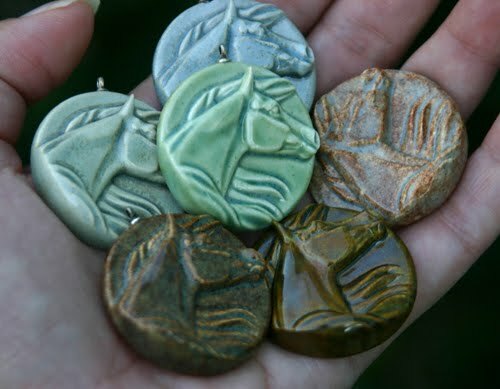 The last pendant is one of the 1.5″ originals (taken from my glaze chip cord). Here is a close-up of the copper version. There is another setting style, but I found that it was just a fraction too small so the pendants would need a slight trim to fit.I am looking forward to making some jewelry with the pendants. I love the look of the pottery with base metals and silk cording. For those that haven’t seen this type of jewelry before, I’d highly recommend the Vintaj website. It is full of wonderful products and ideas, as is their blog. Love how these came out! Are these 06 glazes? May I ask what glaze you used on that blue/green double sided bead? Yes, they are all 06 glazes. 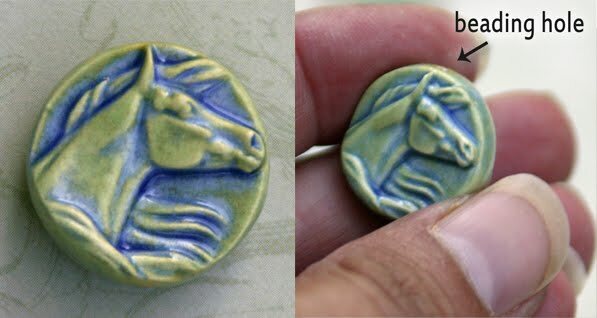 The double-sided bead has a blue transparent glaze that was applied and wiped off, then a light green glaze applied over top. I love these! Any chance you could do a silver-tone when you get to the selling stage? I have some silver-plated ones on order, as well as a variety of different styles. I never realized there were so many of these available! Thank you! It’s such a lovely combo. Your pieces have such lovely glaze colors. I especially love the purple tones you get. Are you also working with low-fire glazes? How am going to get one of that Ceramic beads and base metals? I find it very beautiful and awesome. I wish I can have one of that.